Burn it. We heat our house during the winter with our wood stove. This will supplement the 2 cords of pine I plan on harvesting this summer in the national Forest. piney is a lit’ral mountain man. who knew. If it is a 30' black locust it is more likely that the pine will supplement it. That stuff burns hot and slow. Yeah it is great. That is the stuff we put in at night and let it burn till the morning without having to feed the fire box. The pine is for the waking hours. Two layers of 3/4”, bottom is plywood and top is MDF. Made it two layers so I can replace the MDF as it gets worn out. Here it is stored above my table saw. I need to get the wires attached and out of the way, but it fits and works. 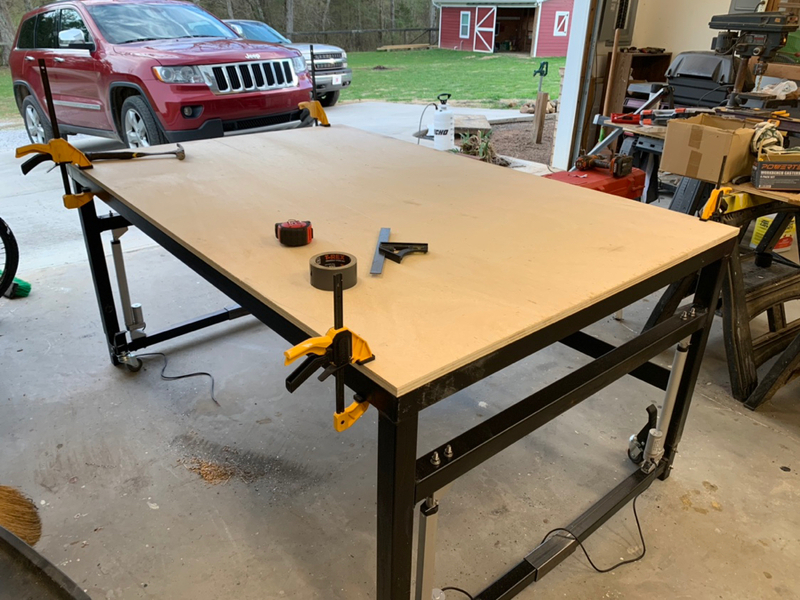 So, combination work table, out feed table that can be stored in the useless space above my table saw. Last edited by Brian; 04-10-2019 at 10:45 AM.